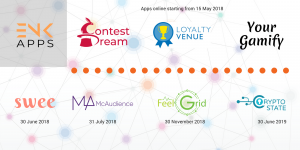 “Enkronos Apps” is a powerful multi-application ecosystem for advertising solutions, marketing and promotions, gamification, artificial intelligence, augmented reality, internet of things, big data and e-democracy, just to name a few areas. All the applications that will be published share a unified authentication system (SSO) that will also facilitate interoperability and greatly enhance every data-driven project in a common cloud-based environment. Furthermore they’ll have a unique Credit Ethics System, thanks to the use of the blockchain. This is a real answer to the serious ethical issue in the use of big data raised by the recent case of Facebook — Cambridge Analytica.